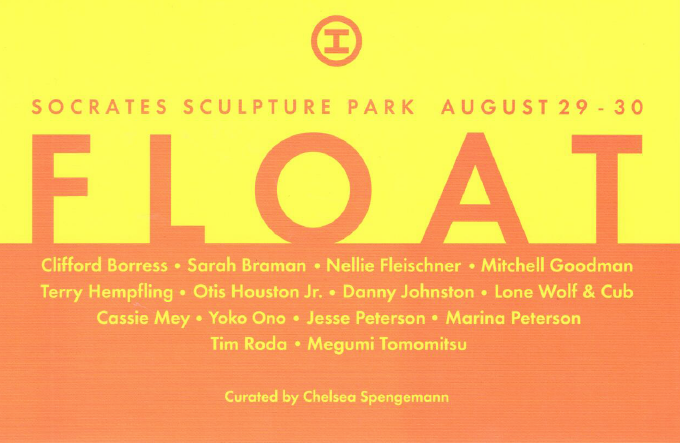 Socrates Sculpture Park is pleased to announce the 2009 edition of FLOAT, the 4th biennial series of interactive installations and ephemeral sculptural works. This year FLOAT will feature performance and temporary sculpture created by 15 artists specifically for Socrates Sculpture Park. The exhibition will take place during the last weekend in August. Performances are scheduled at the top of every hour from 2-6 PM on Saturday and 2-5 PM on Sunday. Inspired by an ironic motivational family saying, “Float your hardest!”, this year FLOAT embraces Socrates Sculpture Park as a place for relaxation, slow summer- time movement, and vigorous people-watching. The artworks will be presented as encounters and interventions for the passerby. Although they will appear spontaneous, experimental, and fleeting, the artworks made for FLOAT will also exemplify the dedication, thoughtfulness, and social interest that the contributing artists embrace. ‘Floating hard’ takes a willful commitment to being buoyant and pliant in the surrounding currents. Megumi Tomomitsu will begin both afternoons with a performance based on her photography series, Fantastic Plastic Collection. On Saturday, wearing a customized bag costume, Tomomitsu will wash, hang to dry, and fold her growing collection of plastic bags. On Sunday, Tomomitsu will place small plastic fruits in the bags before hanging them in a tree. The bags will amplify the wind blowing through the branches for the rest of the day. Pillows will be installed around the base of the tree to encourage a momentary rest surrounded by the meditative sound of the wind. At 3 PM on Saturday and 4 PM on Sunday, Danny Johnston and Cassie Mey with guest performer Terry Hempfling will perform Susurrus, a playful, choreographed dance using trees and small wading pools. Susurrus is a word used to describe a whispering or rustling sound. On Saturday at 4 PM, Nellie Fleischner will perform Paint Box, twisted up on a tree swing that hangs in the middle of a 10ft tall wood structure wrapped in fabric. When released, paint cans hanging from the bottom of her swing will be lifted by centrifugal force and spin paint onto the fabric to create a surprisingly uniform abstraction. The paint will be visible from the outside as it soaks through the fabric upon contact. Saturday at 5 PM and Sunday at 4 PM Otis Houston Jr. aka Black Cherokee will perform a series of gestures, promoting physical and spiritual wellbeing. Sculpture and signs, like those Houston has energetically been displaying for motorists on the FDR since 1997, will also be installed throughout the park. Closing the event on Saturday evening at 6 PM siblings Jesse and Marina Peterson will perform songs and improvised music. Marina is a cellist, performing primarily experimental contemporary and improvised music. Jesse will play guitar, violin and mandola, and provide vocals. For the final performance on Sunday at 5 PM, drum and trapeze duo Lone Wolf & Cub will perform in the Socrates studio. Ryan Sawyer will play the drums and Suzanne Rogaleski will be on trapeze. 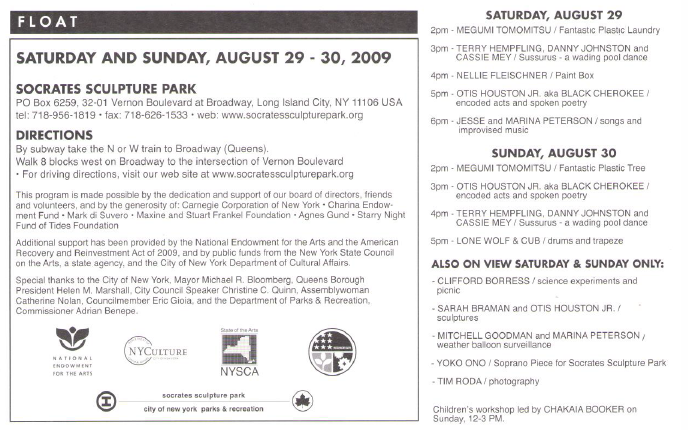 In addition to the scheduled performances, artists Clifford Borress, Sarah Braman, Mitchell Goodman, Yoko Ono, and Tim Roda will have temporary projects on view Saturday and Sunday during regular park hours, 10am-sunset. Borress will lay out a blanket on which scripted object-oriented narratives will occur; Braman will exhibit new sculpture made from only paint and junk; Goodman, in a collaboration with Marina Peterson, will present Sounding #006, a weather balloon that does low altitude video recording; and Roda will present a life-size version of a photograph that he recently made with his son in Rome, but with the faces cutout for audience members to photograph themselves within the artist’s image. Finally, Socrates is very pleased to present Soprano Piece for Socrates Sculpture Park an instruction piece by Yoko Ono. Ono’s instructions will be posted in the Park for visitors to perform throughout the day on Saturday and Sunday.